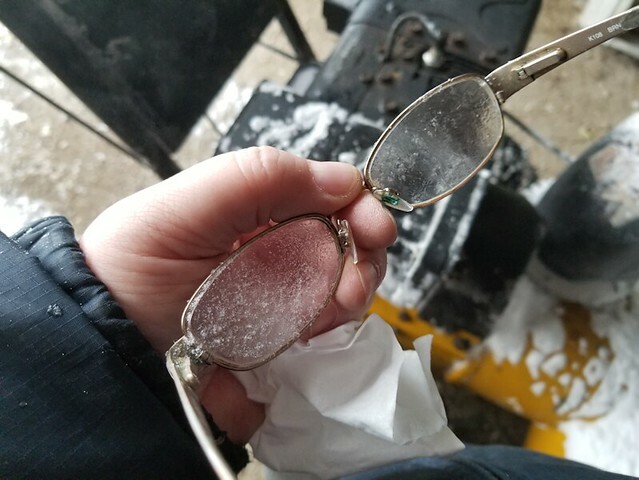 Had a snow-down – and I won! Things have not gone as planned, thanks to some rather unfortunate weather. We were supposed to go into the city for a family gathering yesterday. We drove maybe 5 minutes on the highway, before turning around and coming home. Blowing snow, icy roads, poor visibility… and knowing it would be worse when we were driving home in the dark. Too risky. Maybe if we had a 4 wheel drive and winter tires, but not with our van. Before I went out to use it, I even made sure to re-watch the video I took of the guy who fixed it, walking me through everything on how to use it. I filled the gas tank and checked the oil before I tried starting it, too. Not only did it refuse to start, but it was dripping fuel by the choke and making some rather alarming screeching noises. Turns out that, while using the big gas can to fill the tank, I must have over filled it. After letting it sit for a while, I tried again, and it started. 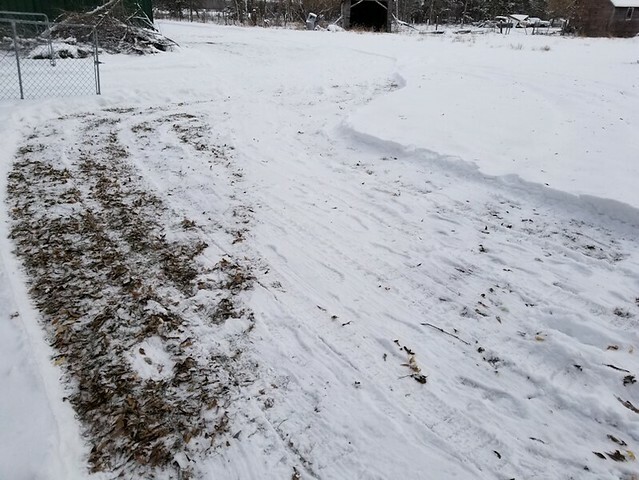 So here are some before and after pictures of the first use of our “new” snow blower! 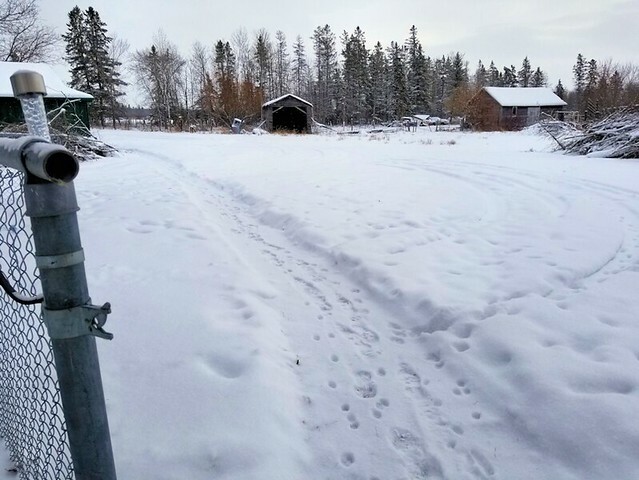 Here is the path to the electricity meter. The first time it was cleared, I was testing out the electric snow shovel, and the extension cord wasn’t long enough to reach the pole. The girls have since been shoveling it out regularly, along with the other most commonly used paths. We haven’t shoveled a path to the burn barrel, though. With a big pile of wood next to it, now, we don’t want to risk a fire. So we take our burnables to the dump. The path they shoveled to the garage is wider, for the walker. Now there’s room for someone to park. The bare minimum was being shoveled in front of the garage and, of course, the driveway wasn’t shoveled at all. 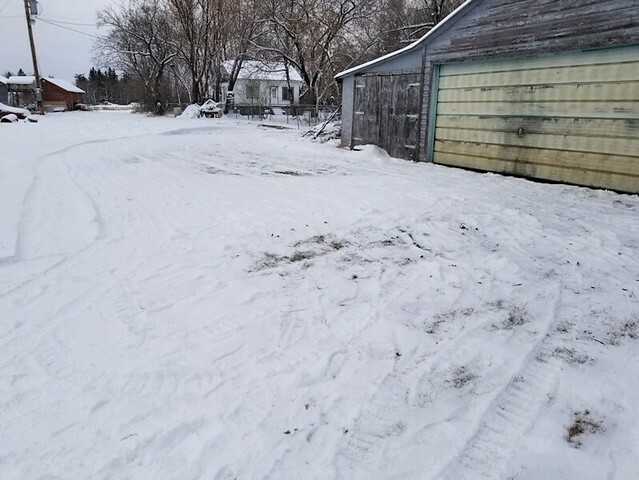 Now it’s clear enough that we can get my mom’s car out of storage, if needed, and the side door to where we store the mower and blower is clear as well. 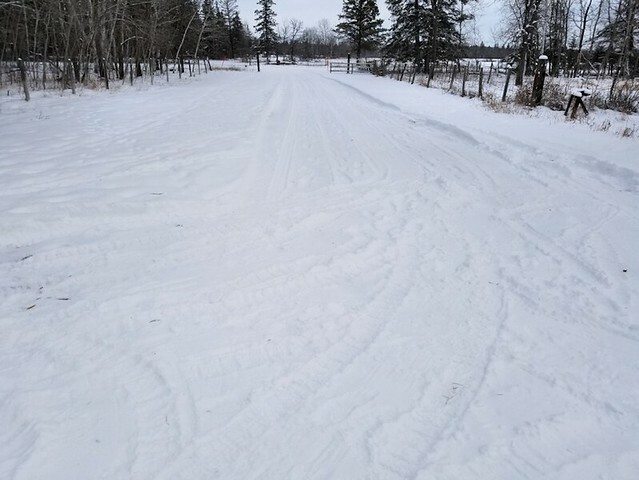 Clearing the driveway all the way to the road was a breeze! 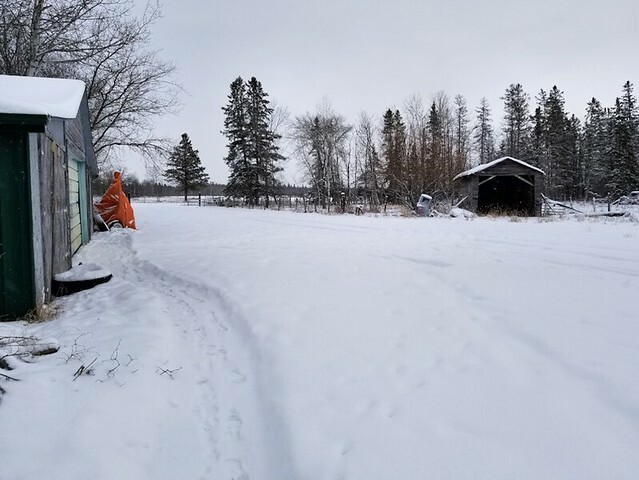 Last of all, I cleared through the vehicle gate, into the inner yard, with room to turn the van, for those days when we have to unload a lot of groceries from the back, or if my husband is in too much pain to get to the garage. 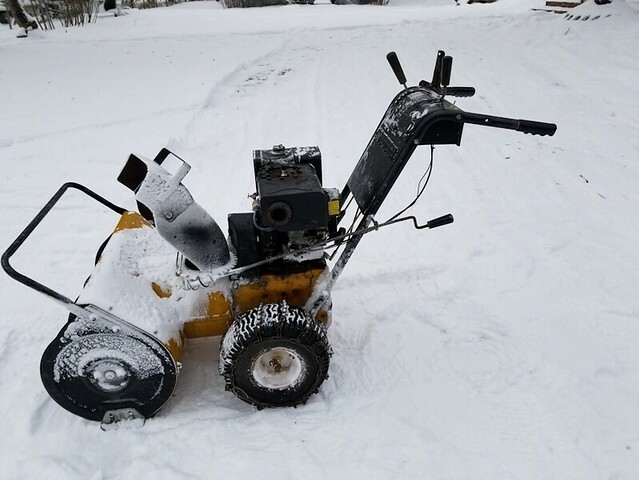 This is the snow blower after it ran out of gas. There was only a pass and a half left through the gate into the yard, so I just left it. It wasn’t going to be an issue to drive over. 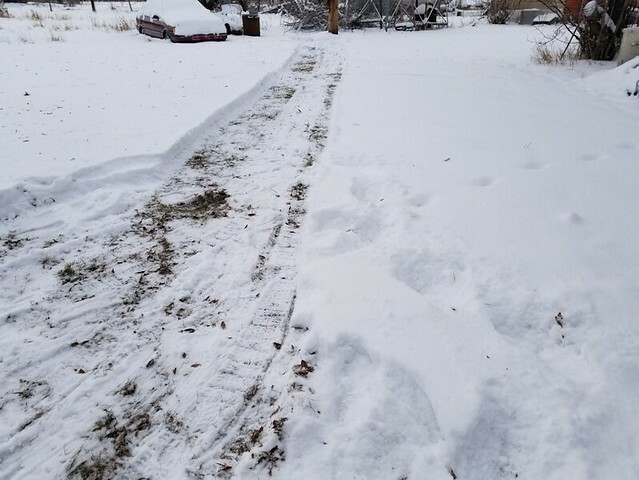 I ended up dragging the snow blower to the garage, rather than bringing over a gas can and an extension cord to start it in the yard, just to drive it back to the garage. While taking them off my face, I also had to carefully remove them from the hair they were frozen to! I must say, when I got in and the girls told me they had a pot of tea ready for me, I was so grateful!!!! I had my phone in my pocket while I was working. 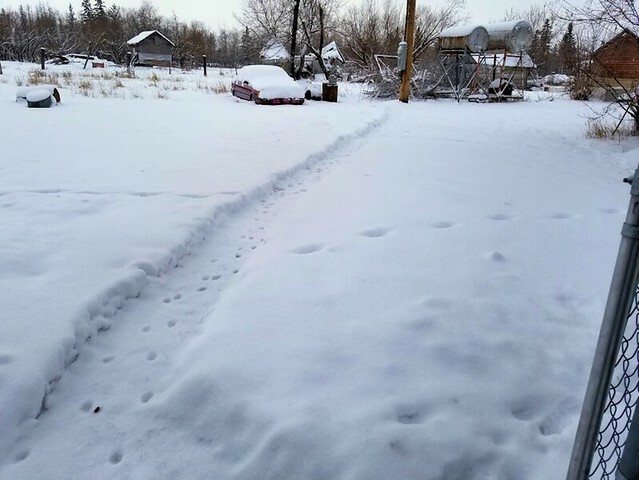 As I went closer to the house – and into wi-fi range -after finishing with the snow blower, I started hearing alert noises. One of them was from my weather app. Severe cold warnings over the next few days, with temperatures potentially reading -40C to -45C (that’s -40 to -49 in Fahrenheit). Looks like I got this done, just in time! My MIL regaled me with how, back in the day, it was traditional to go from house to house, every night, from revelion (the traditional feast after Midnight Mass) through to the Epiphany. There would be tonnes of food, and the kids would fall asleep in big dog piles among the coats collected in some bedroom while the adults eat, drank and made merry. Everyone took 2 weeks off, back then, and there were dozens of households to visit (my MIL alone was one of 13 children; I don’t even know how many aunts and uncles she had in total).